The first day of our journey was spent driving, of course. It has become a tradition for us to caravan with our friends, McCall and Eric. They have 3 boys and a baby girl that is 6 weeks younger than Devin. In total, that makes 4 adults, 1 teenage girl, 5 boys, and 2 babies under 6 months of age. Wowsers! We arrived at Arches National Park. We woke up early the next morning for a hike to Delicate Arch. 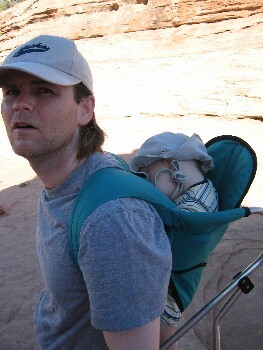 We loaded the two babies onto their daddy's backs and away we went. I was so proud of all the kids especially the little ones who made the 3 mile hike. They were real troopers. I've seen this awsome rock from a distance several times, but to see it up close is amazing! It is huge! The scenery is spectacular with its red rock and blue sky. One thing to get a momma's heart pumping is trying to convince all the boys that climbing on rocks is fun unless you are next to a cliff! 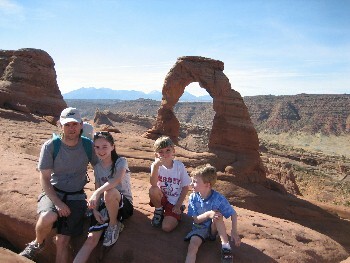 At one time our husband's had disappeared and we were trying to feed the babies next to the Delicate Arch with all it's cliffs while keeping the boys safe. My friend McCall and I had a hair raising experience trying to keep a handle on all the testosterone in our group! After our hike we hurried back to our hotel room to clean up and then we spent the remainder of the afternoon driving around Arches. By midafternoon the temperature was 106 degrees and so we enjoyed the view more from our car. After a couple hours in the car we decided to stop and let the kids jump around on some of the rocks. Cameron looked at me and said, "It's 106 degrees and you want me to jump around on a rock?!" 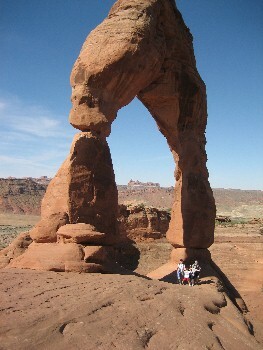 I love Arches and I hope to go again someday when the weather is cooler. I would love to spend time there camping and mountain biking. It's beautiful!